Mary Cary was born on July 8, 1654 in Bridgewater, Massachusetts. 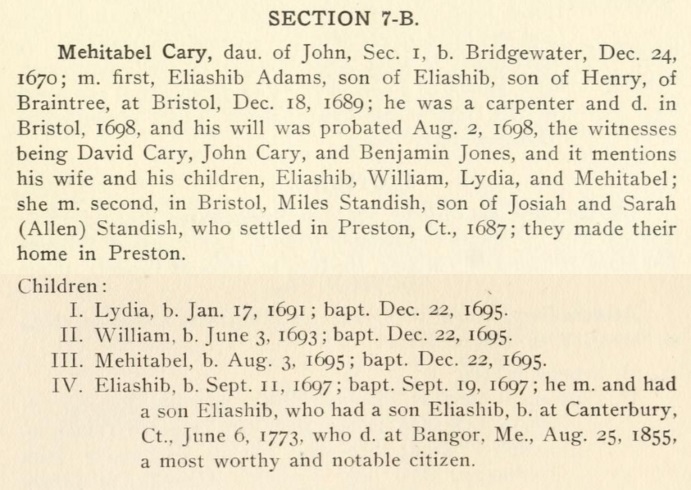 Some websites are claiming she died in 1719, but Nahum Mitchell (History of the Early Settlement of Bridgewater) stated that that Mary Cary was the daughter of Francis and Hannah. 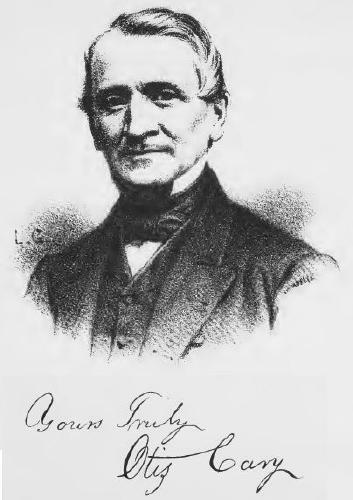 Nahum Mitchel, History of the Early Settlement of Bridgewater in Plymouth County, Massachusetts, , at https://books.google.com/books?id=KIc-AAAAYAAJ . Bridgewater, Massachusetts: Henry T. Pratt, (1897) , p. 131. Henry Grosvenor Cary, The Cary Family in America, Boston: , p. 12. Bradford Kingman, History of North Bridgewater, Plymouth County, Massachusetts, from its first settlement to the present time, , at https://books.google.com/books?id=B-tHAQAAMAAJ . Boston: Published by the author, (1866) , p. 464 lists birth as 14 Aug 1757. Mehitabel Cary was born in 1751. Seth C. Cary, John Cary, the Plymouth pilgrim, , at https://books.google.com/books?id=oDgcAAAAYAAJ . Boston, Massachusetts: (1911) , p. 128, section 71-C.
Seth C. Cary, John Cary, the Plymouth pilgrim, Boston, Massachusetts: (1911) , p. 67, section 7-B. Vital Records of Brockton Massachusetts to the year 1850, , at https://archive.org/details/vitalrecordsofbr00broc . Boston, Mass. : New England Genealogical Historic Society at the charge of the Eddy Town-Record Fund, (1911) , p. 340. Seth C. Cary, John Cary, the Plymouth Pilgrim (n.p. : Seth C. Cary, Dorchester Center, Boston, MA, 1911, unknown publish date), p. 179, sec. 142-C. 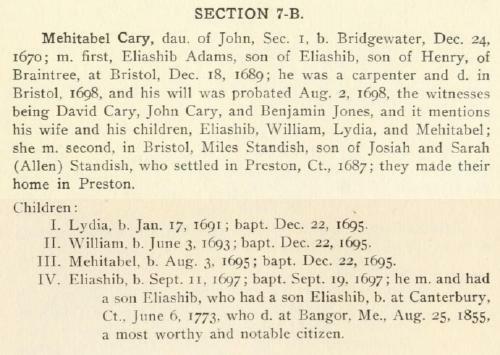 The book gives her birthdate as "1798," almost certainly a misprint, as that would have her giving birth at the age of 12. Since her husband was born in 1785, 1788 seems much more likely. Seth C. Cary, John Cary, the Plymouth pilgrim, , at https://books.google.com/books?id=oDgcAAAAYAAJ . Boston, Massachusetts: (1911) , p. 129, section 74. She was the daughter of James Cary and Hannah Wales. Bradford Kingman, History of North Bridgewater, Plymouth County, Massachusetts, from its first settlement to the present time, , at https://books.google.com/books?id=B-tHAQAAMAAJ . Boston: Published by the author, (1866) , p. 469. Rev. George Mooar, The Cummings Memorial: A Genealogical History of the Descendants of Isaac Cummings, an Early Settler of Topsfield, Massachusetts, , at https://books.google.com/books?id=3aDKR2BtEB4C . New York: B. F. Cummings, (1903) , p. 311.